Bear with me as I tell a bit of a story before launching into the main gist of today's post. 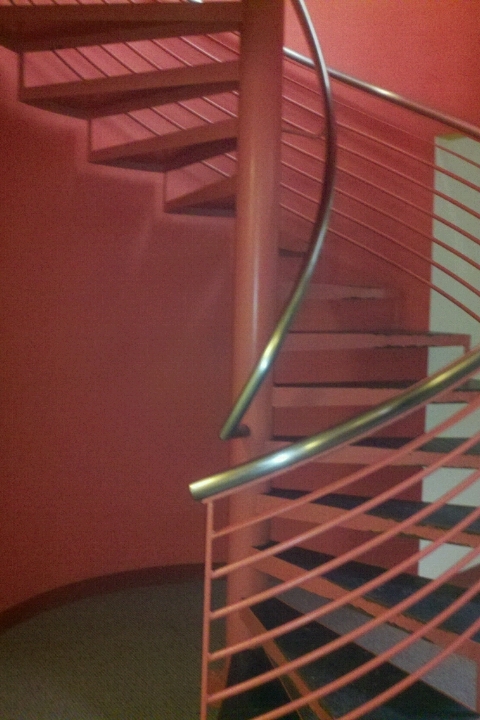 These spiral stairs go from the basement to the first floor. 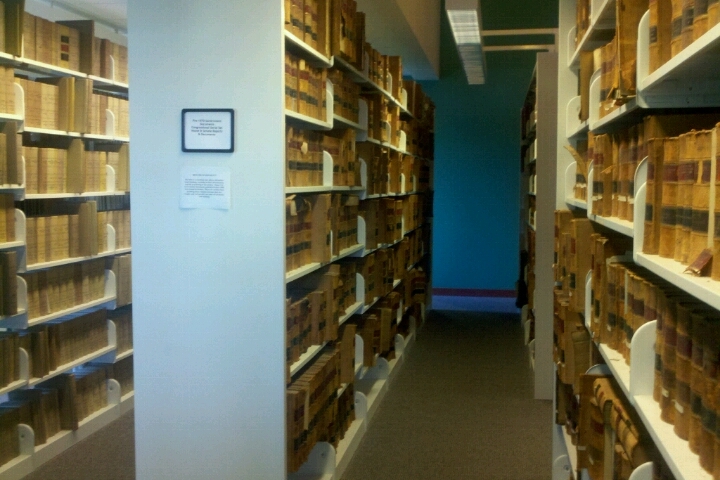 Old, old, old government documents in nice, neat rows. That brings me to my main topic: "the library as place". I keep coming back to that concept, again and again, lately. 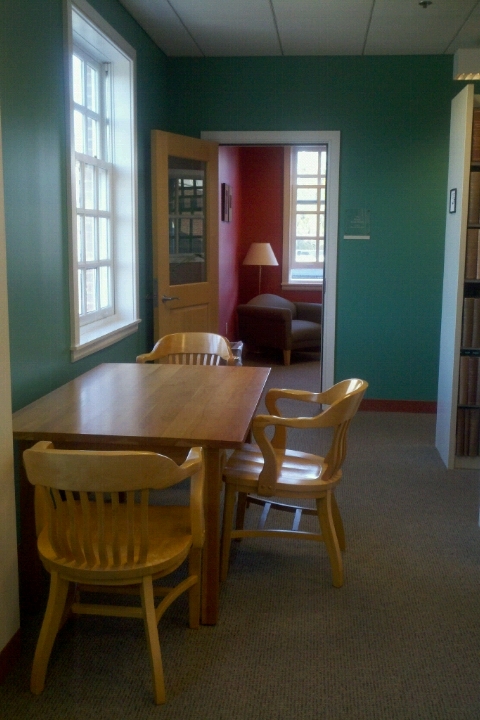 The comfy chairs, the study nooks, the art... all of it makes this a welcoming space. Further, "library as place" is the reason I'm not worried about competing with Google. This library is a community center and a destination on campus. Sure, as a college library, we are here to help with research and to provide access to information, but we're so much more. How can Google ever compete with us? Google's not even a place. What do you think? Why do the naysayers who keep predicting the Death Of Libraries never consider the library-as-place aspect? Update: I just got around to reading this Grant McCracken, HBR Blog Network piece, "Innovating the Library Way," for which I saved the link a little over a month ago. Turns out this HBR writer agrees with little ol' me. Nice. Every librarian knows this story, so I won't take up a whole lot of time with it. See, around 2,300 years ago there was a library in Alexandria. It was a big thing, even by today's standards, because the staff at this library did their level best to acquire every single book and parchment that they could. Ah, but sometimes, there's a piece left out of the historical record. The Library of Alexandria actually made things and took an active role in fostering progress. The great library had more than its share of great librarians who took it upon themselves to move things forward. 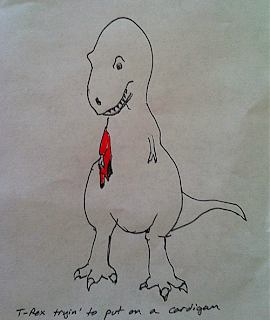 Zenodotus is credited with coming up with the idea of alphabetizing the scrolls. Aristophanes did the world of writing a small favor by creating punctuation. Eratosthenes did the world the small favoring of measuring it. To put it more plainly: in Alexandria, when the librarians needed something for the library, they made it. Now let's get a little more modern. Take a look at Apple, Microsoft, Samsung, or Ford. Where'd the iPhone come from? What about Windows 8? That Galaxy Tab is pretty sweet and Ford's Sync system is amazing. Where'd they get that stuff? Simple, they got it from R&D. R&D, or research and development, is something common to big companies. You don't just make an iPhone. You have to design it. Test the specs. Reality check it. Prototype it. Test it. Fix it. Fiddle with it. It took years to make an iPhone. If you want to make something, you research it and develop it. That said; let me tell you a story. I'll keep it short, I promise. When I scored an awesome job as the Head Circulation Guy for the busiest branch in my system, I walked into a really odd situation. Every day we’d process around 1,000 requests sent in from all over the county. To do this, we loaded the requests onto carts, checked them in using the ILS, and then looked at the patron's name that popped up on the screen. Then we'd hand write that name on a slip of paper and stick it in the item so it could be put on a public pick up shelf. This process took all day. But wait a second, why couldn't the computer do that for us? Isn't that what computers are for? Well, as it turns out, that functionality was “coming in a future release,” but how far in the future was anyone's guess. Sure, we could ask the vendor to fast-track the feature, for a pretty hefty fee. Needless to say, the library isn’t made of money, so that wasn’t happening. We were basically held hostage to the vendor for a feature that we absolutely need. So I sat down and did some research. How did that patron's name appear on the screen? Where did it come from? Could I snag it and use it? Is there any way I could get that name to, say, print out on a receipt printer? As you can see, research means a lot of questions. When you get some answers, you're halfway there. I'm not a programmer. I can write code. I can also sing in Japanese. That doesn't mean I should be allowed to do either. Still, desperate times and all that. Besides, singing a Chage & Aska ballad wasn't going to help us. So I hauled out my bag of tricks, which involved a small bag of coding which held an even smaller bag of Visual Basic 6. Using my research as a guide, I developed a tiny app that did one thing – grab that patron's name and send it to a receipt printer. So it was that, my library, then other branches, and eventually other libraries soon had an app that printed hold pick up slips months before it was implemented into the ILS itself. I don't know if I saved anyone any money and I don't care. All I know is that we went from processing requests all day to getting them done in around four hours. an architectural expert who doesn't work in facilities development. a really good computer programmer who doesn't work in IT. a workflow efficiency expert who doesn't work in operations. a logistics guru who doesn't work for administration. a master carpenter/plumber/builder who doesn't work for facilities maintenance. a mathematician or financial expert who doesn't work for finance. a master negotiator who doesn't work with vendors. What if they got the support and encouragement to use their expertise to make a job easier, or save the library some money, or create a new service, or enhance an existing one? Daniel Messer is a public library circulation supervisor, at Queen Creek Branch Library, who specializes in customer service and library technology and automation. He blogs at Not All Bits. This is his second guest post for this blog. His previous piece is "Managing Change." I am one of those “librarians who don’t work in a library” that you hear about more and more. I supervise the Conflicts of Interest department at a large national law firm. We function as an internal knowledge management center. Our mission and functions are similar to library’s and I often am in the same meetings as the Director of Library Services. My department has a high turnover, as does any department staffing non-lawyers in a law firm. It’s always bittersweet to see employees leave work to attend law school. I end up reviewing resumes, some from individuals with library degrees and more without, almost constantly. This unique, almost library, situation means we list a MLIS as a relevant degree in job descriptions. Too often, I see resumes from prospective employees with MLIS degrees outshined by individuals with non-library backgrounds. I am always looking to bring in people with a library background but I encounter issues that often make that impossible. Hoping I might be able to help a person or two, I thought show you the other side of the application process. A reminder, what I’m describing is the process at a large law firm, but I think much of this holds true for any work environment. You will probably also encounter situations where employers or systems ask you to paste your resume into a web based text box. If this happens, be certain to additionally send in a PDF. If the option isn’t there, try contacting the Human Resource department or representative to see if you can supplement your application. This is something I wish would happen more often. It is commonly the case that a resume is submitted via a text box and then routed to me via email. By this point, formatting has completely stripped out any spacing and pagination. This does however allow me to make somewhat easier decisions. Good resumes will not be affected by this and a bad resume will be rendered almost unreadable. Think about this when using things like headers, footers, columns, and other structural formatting. I realized this was a problem with my own resume a while back, since I had part of it set up to display as two columns and it didn’t always turn out right. As an aside, even if you are not looking for a job, it is a great practice to update your resume a few times a year. It gives you a chance to reflect on accomplishments and gives you fuel for your year-end review. Another issue that I never thought I’d see quite as often as I do is related to contact information. If you are looking for a job, stop and take a look at your email address. What is it and what does that say about you? Hopefully, your email address is some derivation of your name or thereabout. If not, be sure that this is something professional. I’ve seen resumes come in with email address of all sorts, including one that was some form of “partygirl”. That is a sure fire way to have your resume overlooked. Also, be mindful of what social media accounts use this email or user name. Personally, I use one ID so my email is michaelrperry6 [at] gmail [dot] com and michaelrperry6 is my user name on every social media site you can imagine. I’m fine with this because I know the information I’m putting out there, but if you’re unsure, best to set up a job hunting email address. They are free after all. Slightly related, if your email account has been compromised or you abandoned it, make sure everything you send out is up to date with new information. I had a friend whose email account was compromised and then used to set up some less than work appropriate Tumblr blogs. They had forgotten to update their resume so this went out to prospective employers. Talking social media leads us to the big one: should you include a link to your LinkedIn (or any other for that matter) account? This really is a matter of personal preference. I know many people who don’t even bother to check these accounts if they are included and others that will go out of their way to find them. My take, include them if you are comfortable. It functions much like including a PDF of your resume. You control the information and how it’s presented so you have a nice launching platform for people. I would be more hesitant to include other accounts, like Facebook, Twitter, or Google+, but something like LinkedIn or a static digital resume or portfolio work really well. This has the added benefit of presenting yourself as a digital savvy individual, a crucial skill in this job market. I like the idea of setting up a static page as opposed to using LinkedIn, but that may just be that I don’t like the LinkedIn user interface and notification system. Additionally, setting up a simple Google Sites page or WordPress can often give the appearance (deserved or not) have having a good understanding of web development and design, especially to those who do not. I wanted to avoid the topic of tailoring your resume and cover letter to the job you are applying for. First, I think this is a topic that has been covered by many who handled it much better than I could hope to do. Second, if you aren’t doing this you really aren’t taking the whole finding a job thing very seriously. Many of the resumes I review are sent to us as an afterthought. Is there anyone who finds the title of Conflicts Analyst to be super interesting? But I can always spot those people that took the extra effort to read the posting and tailor their resume accordingly. There is a good correlation between those people that took to time and those that end up getting job offers. I hope some of the information here is helpful and if you have any questions, please feel free to contact me. My email address is included above and you can find me on Twitter or Google+ at michaelrperry6. Happy job hunting. Michael holds a BA in Political Science from DePaul University and received his MLIS from Dominican University. This is his second guest post for this blog. His previous piece is "Overlook Opportunities and Missed Connections." I've always worked at small, academic libraries. This means I've become a professional generalist and jack-of-all-trades. I can talk tech, pop culture, academician, pedagogy, marketing, business, etc. With a few exceptions, I learn whatever it takes to better serve my community. That's part of why I got into this field, because at its core, librarianship is a customer-service-oriented, helping profession. It's also part of why I got my first professional position. Imagine me there, sitting across a table from the library director and another librarian. It was a miserably hot day, that library didn't have air conditioning, and my fancy interview outfit included a black blazer. The heat wasn't the only reason I was sweating, though. Part of it came from trying to sell myself despite my lack of experience. Eventually they asked me a question about connecting my job history to librarianship. I hit it out of the park with my answer. I had a lot of customer service experience since I'd worked at a (sort of) upscale seafood restaurant. To be successful there, either you get used to dealing with a variety of people or you get out. We had customers who'd never been to the restaurant before, and I'd hold their hands through the entire dining experience. Other customers had been coming to that restaurant since it had opened, and for them I would only highlight new things. Most people who sat in my section fell between those extremes. Expanding the point, I told them that I'd use the same approach when working with library patrons. First semester freshmen need to have their hands held. Predominantly, professors only need an occasional pointer or to be told about new resources. And most people who come to the reference desk are somewhere in between. They agreed and the rest, as the cliché goes, is history. I still use that approach. Figuring out where people fall on the spectrum of library experience is one of my favorite things about working at the reference desk. I need time off of the reference desk, the same as most people, but I love working there because I love working with people. What do you think? Am I crazy for thinking of librarianship as a helping profession? I sit at the desk in my office, with piles of printouts from meetings, ledgers, and names and phone numbers of library staff. I have a To-Do List with stuff like “Collection Development Policy” and “upgrade Drupal sites” written on it. When I walk out my door, I do not see patrons browsing or the circulation desk, I see open cubicles with support staff (plus the prerequisite candy bowl). I am a librarian, but I work for a library automation network in central and western MA. We centralize the integrated library system software, allowing the 140-plus member libraries to share resources and costs. I am in charge of the Access Services department, which puts the online catalog, reference databases, digital repository, and OverDrive catalog under my purview. I have been here for 4.5 years, and before that I worked as a cataloger in two different libraries. I like my job but I do miss the books. When I entered library school in 2001, I was convinced that I was going to become a school media librarian. I had two young children and knew that the two school librarians in my town were going to be retiring soon. I had it all worked out. Then I took my first children’s literature course. It was fine, but I tended to enjoy the young adult titles more than children’s literature. Even that was fine, since I figured I could work at the high school! I took one class that would give credit toward the education part of the degree, and looked into the test that would allow me to opt out of the other part. In 2003, New York announced that it was revising the qualifications for the school media degree; there would be more internships, more education classes. Around the same time I had just taken my first cataloging course. I fell in love with it (I am a numbers kind of gal) and it became clear that the idea of staying in school another year (or more) wasn’t for me. So, with one semester left to go, I switched from school media to a general MLS, and determined that I would become a cataloger. That lasted for a few years. I found myself enjoying the acquisitions part of my job as much, if not more, than cataloging. I got involved in the teen group (more young adult literature!) and the network’s OverDrive Selection Committee. Then a pilot project was announced for a new network digital repository, and my library was part of it. Digging through boxes of old photos, creating metadata, and seeing it all put online was a new and exciting adventure. So, when the network advertised for a Digital Resources Librarian, I figured I would give it a shot. Digitization was a growing field, and a job that enabled me to combine my desire to stay current and work with cataloging rules seemed to be a good combination. And it was. Four years later, I am now the head of that same department. I took one basic HTML course in graduate school, but now work with Drupal, PHP, ILS systems, and more. Almost all of my coding experience has been gotten on the job. Even though I now have a technician that handles the actual scanning for our digital projects, I currently serve as the President of the Digital Commonwealth, a portal and repository that serves the entire state. I no longer get copies of Library Journal and Publisher’s Weekly piled on my desk to review titles for purchase, however I do oversee the OverDrive Digital Catalog for the network, so I still do some collection development. I do not talk to patrons every day, or place holds, or answer reference questions--my patrons are all library staff. The old adage of “best laid plans” seems to be one that is important for librarians. As duties, budgets, and interests change, shifts are happening all across the profession. In many schools, you cannot even get a “library science” degree anymore; it is “information science” or “informatics.” The number of people who stay in the same position for their entire work career is small, and with changes in technology, librarians can find their jobs ever-evolving even if they do stay put. None of this is what I went to library school for, but is where I am now: looking forward to the next opportunity to grow as a librarian. Kristi Chadwick is the Access Services Supervisor for C/W MARS, a library network for central and western Massachusetts. She blogs at The Plugged-In Librarian and at Books, Yarn, Ink and Other Pursuits. You can find her most days on Twitter @booksNyarn. I have a confession to make: I'm a random tweeter. On Twitter, I talk about comic books. I talk about cats (a lot). I talk about chocolate and music and science fiction television shows with cult-like followings. I also talk about higher education, the publishing industry, and libraries. That's the point of Twitter, in my mind: to talk about the things you care about. (For the record, I'm just as varied on Facebook, Google+, and Pinterest.) I care about my career, but it's not all I am. I think of this as the Popeye Principle, because I am what I am. And I refuse to filter what I say on social networking sites out of fear of some mythical future employer. Let me say this again: You cannot live your life worrying about what future employers may or may not think about you based on your Twitter stream, your Facebook page, your Pinterest boards, etc. Joe Hardenbrook wrote a wonderful (and popular) guest post for my blog about how you need to look at future employers to see whether or not they'll be a good fit, and the Popeye Principle is based on a similar philosophy. Perhaps someone will judge me as unfit for a job because of an off-color tweet, or think me too political because of a blog post, or worry about my sanity because of my current obsession for all things Doctor Who. If that happens, then so be it. "Life's too short," is a cliché because it's true. If someone doesn't want to hire me because of my eclectic interests, then why would I want to work for them? 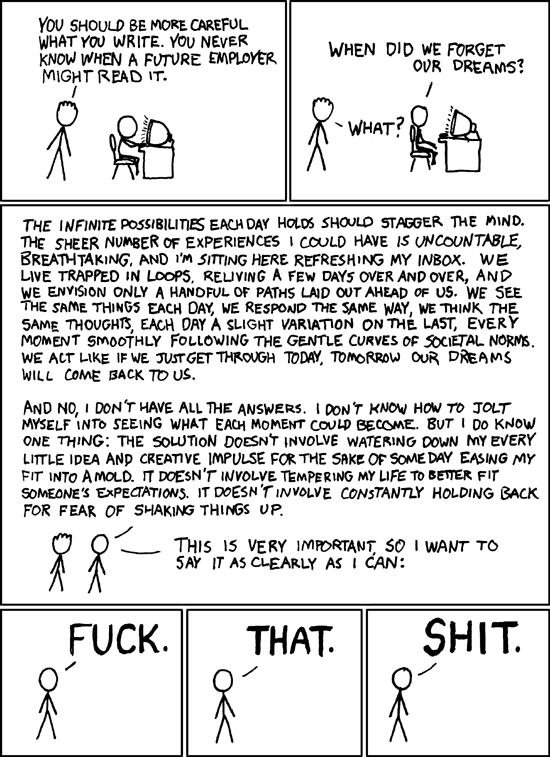 If you don't believe me, then believe Randall Munroe of xkcd. He explained the Popeye Principle (although by a different name) better than I could ever imagine doing it. So what do you think? Am I wrong? Right? Why? Zach Weiner, the genius behind "SMBC," gets it. While higher education is not his only topic, he understands academics and their foibles at such a basic level that I have, more than once, thought "Oh my lord, that is Professor Whatshername to a T." The few times I've had the nerve to share the comic with the professor in question, the response is inevitably a laugh followed by something like: "Yup. That's me." First, there's the name. 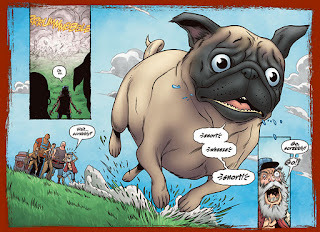 How can you not love a comic titled "Battlepug"? Then there's the Conan the Barbarian meets Homeward Bound quality to consider. There's hack-and-slash, honor, and glory, alongside lots and lots of (giant) dog spittle. I grew up going to the Museum of Science in Boston. I'll never forget their commercial which featured, among other things, a little girl looking at the T-Rex model and saying, "Why does he have such funny little front legs?" 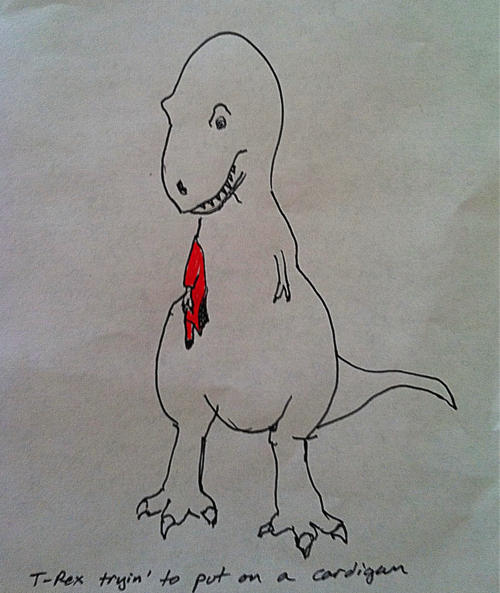 Those front legs are the inspiration for all of the jokes in my newest webcomic love, "T-Rex Trying..."
T-Rex tryin' to put on a cardigan.. There's something not quite right with Emily Horne and Joey Comeau, the creators of "a softer world," but in the best way possible. There isn't a theme, but in their own words: "Sometimes the 'comic' is sad or harsh. It should be noted that this is in the tradition of George Simenon's 'romans durs' (or 'hard novels') and not in the lesser traditions of comics like Peanuts or anything else not French." Don't miss the punchlines which are always delivered in the hover-text. Hover-text: "Oh listen honey! She's purring again!" Original here. Hover-text: "Come on, man. Use your evil cow brains for once." Original here. There are plenty of others I read. Some examples are "xkcd," "Dork Tower," and (as is required of librarians) "Unshelved." However, if I were to list all of my webcomics, we'd be here all day. So, how about you? What are your favorite webcomics?